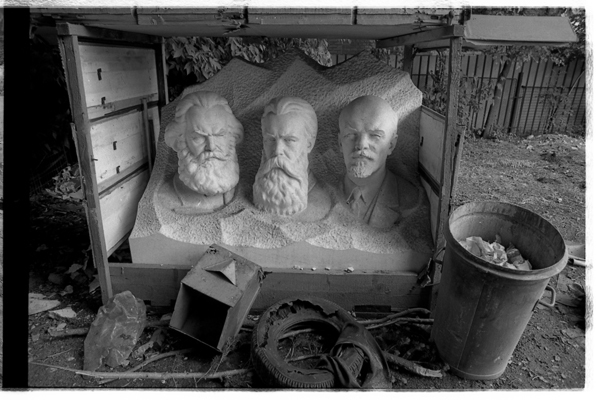 Figure 1: The statue of Marx, Engels and Lenin in the back yard of the National Museum of the Romanian Peasant (NMRP) @ Marius Caraman/ 1991, Image Archive of the NMRP. This image comes from the Image Archive of a museum. It was taken in 1991, two years after the fall of the Ceausescu’s regime in Romania. 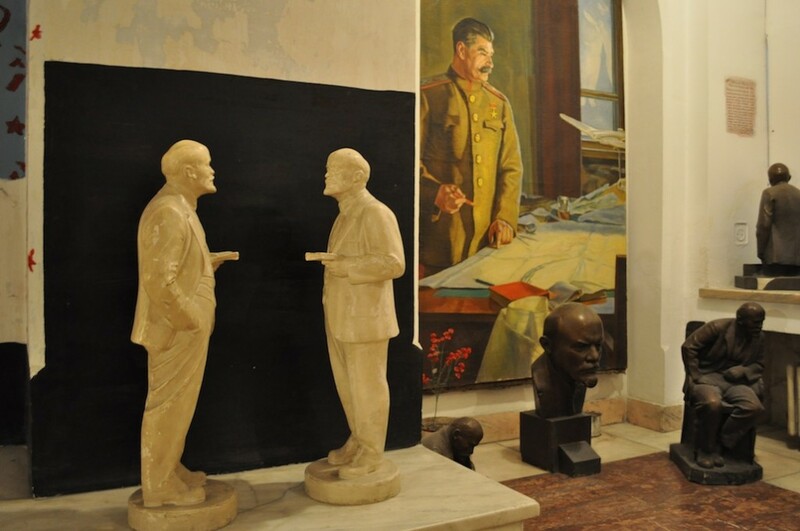 Even so, one can wonder what a statue of three famous communist ideologists has to do, even in the backyard, with an institution which mainly exhibits ethnographic objects. Another subject of reflection, that the image provokes, is the ambiguous situation in which the statue finds itself: near the garbage bins, but still covered with a roof as if protected. In this text I will briefly discuss two themes that emerged during my fieldwork research in the National Museum of the Romanian Peasant (NMRP) in Bucharest, Romania. First theme is concerned with the changing nature of the display in the history of a museum. How are different visual representations of the same objects used by radically different ideologies to re-assemble particular social ideas about the peasant in Romania? The second theme is concerned with quite different questions: what do neglect, iconoclasm and vandalism mean in a museum context and how do diverse ways of destruction actually lead to the construction of new displays? An entire panel that I co-organise (with Raluca Musat) at this year’s European Association of Social Anthropologists (EASA) conference (W110: Confident museums of uncertain pasts, www.nomadit.co.uk/easa/easa2012/panels.php5?PanelID=1184) on 11th of July 2012 will discuss the way museums use and make visible the controversies and uncertainties of their past and that of the societies to which they belong. The Museum of National Art, Ethnology, Decorative and Industrial Art was born in 1906 under the guidance of an art historian, Al. Tzigara-Samurcas. The institution attempted to promote ‘peasant art’ as the basis of the unity of the newly formed Romanian nation state. After the Second World War, the museum was completely changed by the new regime. 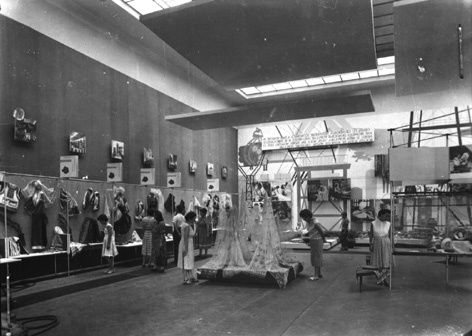 The initial collections were split among other institutions; the employees were re-trained in line with the exigencies of Stalinist Cultural Revolution and historical materialism, and the displays of ethnographic objects were fundamentally altered. An important thing to be mentioned is that the museum’s building was occupied by different other museums dealing with communist propaganda. In the following image, one can see what an ethnographic display of costumes meant in the 1950s: items from all the ethnographic regions of the country were stitched in a series, one after another, on the boards, inside glass cases. Labels, as well as maps would sustain the theme of the exhibition: the representation of the costumes from all the ethnographic regions of the country. Images at the top of the costumes and maps, would present factories and collectivised lands, but not collectivised peasants. 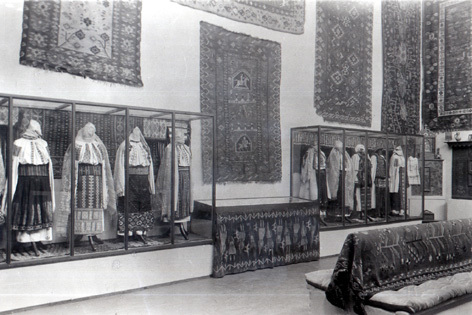 From the 1950s, Muzeul de Artă Populară (a name that can only be roughly translated as the Museum of Folk Art) received the collections of ethnographic objects from the previous institution. In just two decades the collections were tripled, by making new acquisitions from regions across the whole country, adding to them artisan objects and objects donated by other museum institutions all over the world. The collection process was so extensive that in 1971 the museum ended up by literally being transformed in a store and closed to visitors. What mattered were the numerous temporary exhibitions organised in the country (in factories, schools, and community halls) and abroad. After the earthquake in 1977, when the building of the institution was damaged, the Museum of Folk Art closed its gates and its collections entered the deposits of another museum that displayed rural life, the outdoor Village Museum. In 1990s, after the fall of communism in Romania, a new team of curators mainly lead by the contemporary artist Horia Bernea started to re-construct the display, by neglecting the institution’s communist history and aesthetics and reinforcing the glorious past of the inter-war period. The reunited collections of the two previous museums were replaced in the original building under the new title of the Museum of the Romanian Peasant. However, this museum claimed its ideological and physical precursor was in many ways the original Museum of National Art, even if ironically much of its present power of attraction came from the way it integrated through opposition its communist predecessors. In order to obliterate the communist past, the new museum team literally dismantled piece by piece the previous display of the Museum of the Party (officially opened in 1966), asked priest to ‘purify’ the space with holy water and prayers. Objects, boards, slogans, glass cases were taken away, transported to other institutions or made to pieces or thrown away. Some other objects have been collected and displayed in other exhibitions and projects about communism. Now the NMRP is the only institution in Bucharest to have a permanent display about the recent socialist past, as well as many other objects related to this in its stores. This text presented the history of a museum institution and its various ways of displaying objects in its collections. The nature of the museum’s collection is changed over time: national art became folk art during communism. Today, even if the NMRP should exhibit only objects related with peasants, it combines ethnographic objects with fragments of a deleted communist past. I showed how different institutions and their trajectories of collection and exhibition making impacted on the present display in the NMRP. My PhD thesis at Goldsmiths College, Department of Anthropology as well as the EASA panel W110: Confident museums of uncertain pasts will develop more on the above mentioned themes. In this text and in my PhD thesis I use the term ‘communist/ Communism’ when I discuss the realities of the People’s Republic of Romania (1947-1965) and The Socialist Republic of Romania (1965-1989). By making use of the term ‘communism’ people in Romania denominate the recent past and the socialist regime. One reason for this appellation is that the name of the only party in power during this regime remained unchanged: the Romanian Communist Party.